This morning, Overstock.com announced that it will be going live with the website O.biz on October 31,2009. The new site will sell mostly restaurant, office, and hotel products, with a focus on small businesses and consumers looking to buy in bulk at greater discounts than are found on the Overstock.com website. Some people might ask why Overstock would want a .biz domain name for this project. You can’t argue with the fact that it’s memorable and short, two things that an established brand cares about. Likewise, the .Biz registry will have a showcase website, one step in building consumer awareness. In my opinion, consumer awareness is what drives domain registrations after the initial speculative period ends and domain speculators choose whether or not to renew their domain names. The more that consumers are aware of a specific domain extension (and familiar with brands that use them as standalone sites rather than redirects to a main .com site), the more value the domain names have. This drives both consumer and business adoption of these domain names. 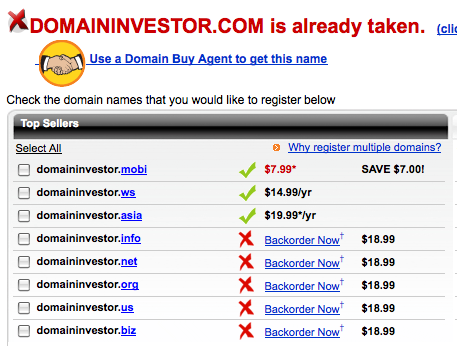 If this new site is a hit for Overstock, it will certainly be a boon to .Biz domain names, which in my opinion aren’t very coveted right now, despite being listed as a “Top Seller” on registrar websites like Godaddy, which is an effort to upsell or downsell additional extensions. With new gTLDs presumably coming, the .Biz registry will end up fighting for this valuable real estate with up and coming domain extensions, and it needs to prove that that people will buy them. What about something like sangria.biz? How much could that be worth? I have no idea… I don’t track .biz sales and don’t own a .biz domain name. I love your blog.I’m glad I found it. I hope to start making profits soon. I’m addicted to this game! My dilemma is how in the world will I develop 100 websites! You should write an article on how to manager 100+ domains names. I’m awfully glad to see Overstock try out O.biz. And Sedo auctioning many of the single letter .biz cannot hurt either. @Nick – You might try out DevHub.com for easy development. I’m beginning to work with their software and experimenting with options. Lubbock.us is a DevHub site with a very simple design. This can maybe give you ideas.